Across the country, women’s Self Help Groups (SHGs) are playing an important role in women’s empowerment, financial inclusion, supporting livelihoods etc. Programmes for promotion of SHGs have been initiated to fill the gaps in accessibility and efficacy of mainstream institutions such as panchayats in reaching the women and the marginalised. The SHG movement was started in the country to address the failure of the mainstream development machinery of the state to adequately reach the marginalised. SHGs were designed for promoting regular savings by the members to counter their exploitation by money lenders charging exorbitant interest rates on loans. 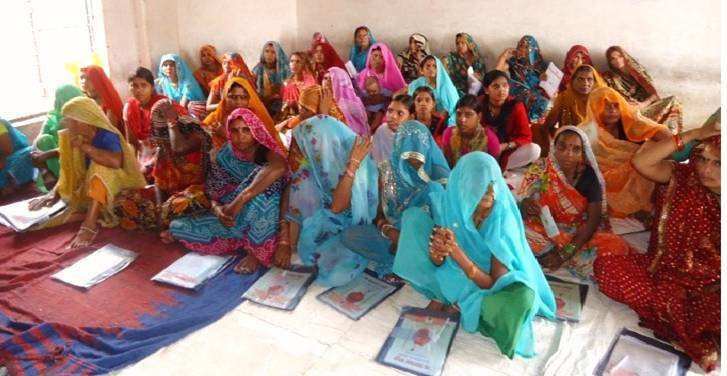 Today, SHGs in our network have graduated into institutions which not only help the members save money for any unplanned and unexpected expenditures but also help in connecting them to livelihood opportunities. These SHGs also facilitate various development processes in their own and neighbouring villages. The government too has started to recognise the latent potential in the SHGs and the benefits of integrating them into its development strategy. Getting local SHGs to implement the midday meal scheme in schools is a good example of this strategy. Adoption of participatory processes in decision making and principles of democracy and equity within the group empowers its members through knowledge dissemination and exposure to new ideas and practices. This also leads to the members’ demand for higher level of transparency in the functioning of their group. Institutionalisation of SHGs (or any other grass-roots organisations) in the form of federation further strengthens each of the member groups. When SHGs come together institutionally, they learn from each other. Federations are also better equipped and empowered to influence and have greater impact on the local development processes by virtue of their collective bargaining power for common welfare. Their strength lies in their numbers that give them a stronger say in local political processes and compels other stakeholders and authorities to listen to them and consider their voices, opinions and needs. However, despite such immense potential and possibilities, the effectiveness of federation level institutions in North, North-Eastern and most parts of Central India has been limited. In South India, on the other hand, a significant number of success stories have emerged demonstrating the effective operation and functioning of federations. Interestingly, there are no fixed guidelines for formation of federations with respect to either their institutional structure or legal status. This has led to an emergence of a variety of institutional models. It may be said that federations, especially in the Northern part of the country, are still at an evolving stage. It would be interesting to have a quick look at various types of federations that are considered appropriate for different locations and target groups as per the understanding of the promoting entity and according to the local context. Going by the study conducted by Andhra Pradesh Mahila Abhivruddhi Society (APMAS), the typology of a federation may depend on its objectives, promoter’s philosophy, available resources, interest of the primary stakeholders, absorption capacity and willingness to interact with others, and also the local cultural and geographical context. Objectives of the federations may include strengthening of SHGs, providing value added services, scaling up of programmes, facilitating linkages, promoting women empowerment, partnering with the promoting agency for programme implementation or a combination of these. Some promoters prefer to retain control over the federation and oversee and manage its functioning, in which case the control resides outside the federation, whereas other promoters adequately empower the federation to function independently so that the control lies within the federation itself. Development Alternatives (DA) has institutionalised twenty farmers’ clubs into Bundelkhand Harit Kisan Mandal, a federation that has taken up the responsibility for establishing linkages with resource agencies and companies, thus helping the farmers to access quality inputs such as seeds and fertilizers. It is also promoting good practices amongst the farmers and enhancing their knowledge base and awareness levels. This institution is being mentored by DA with the objective of establishing linkages for scaling the climate change adaptation programme of the organisation by facilitating and catalysing the stakeholder’s initiatives. There are certain challenges blocking the movement forward. As mentioned earlier, there is a lack of successful models in Northern India. The federations initiated by DA are fairly large, each having about 250 member SHGs in its fold. Such a large membership brings in considerable diversity in the profile, interest levels, expectations and capacities of its members. Therefore bringing all member SHGs together to develop a common mandate and a common path for their federation will prove to be a major task but the team is ready to face the challenge.